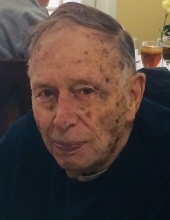 Peter Carl Zaremba died at Mary Washington Hospital in Fredericksburg, VA on December 29. Born in Frelinghuysen Township, NJ on September 25, 1933, he was a resident of Pennington for 51 years before moving to Stafford, Virginia in 2013. After more than 39 years of service, he retired as a MSG from the New Jersey Army National Guard and, after 31 years, Pete retired from the Defense Industrial Supply Center where he was a Quality Assurance Specialist. Pete was also a member of St. James Church of Pennington. He was a beloved husband, father, cousin, friend, mechanic, pilot, and a Double Distinguished shooter. Pete is survived by his children, David, Kathy (BJ Payne), Sharon (William Schmelling), and Rob (Joy); grandchildren, Tyler, Cassie, Ashley, Zen, and Lisa. He is preceded in death by Pat, his wife of 53 years and his parents Michael and Olga (Orach) Zaremba. Mass of Christian Burial will be celebrated at 11:00 a.m., January 4, at St. James Church, 115 E. Delaware Ave., Pennington. Visitation will be from 10:00 to 11:00 a.m. January 4, in the Gathering Room at St. James Church. Interment will follow in Harbourton Cemetery. To send flowers or a remembrance gift to the family of Peter Carl Zaremba, please visit our Tribute Store. "Email Address" would like to share the life celebration of Peter Carl Zaremba. Click on the "link" to go to share a favorite memory or leave a condolence message for the family.